VietPress USA (June 21, 2018): Today on Thursday, June 21, 2018, First lady Melania Trump made a very surprised thing to Media when she wears jacket with wording "I really don't care, do u?" to visit separated children from their families arrested at US-Mexico border for illegal immigration under "zero tolerance" policy announced by General Attorney Jeff Sessions in April 2018. Trump attacked Democrats in Congress, blaming them for the separation of families at the border because they had created "horrible laws" and had been "weak and ineffective"; but in fact that the "zero-tolerance" policy was introduced in April 2018 by Attorney general Jeff Sessions of Trump administration. With this Trump's "zero-tolerance" policy, all adults caught crossing the border illegally are detained and prosecuted, rather than being released while they await proceedings. 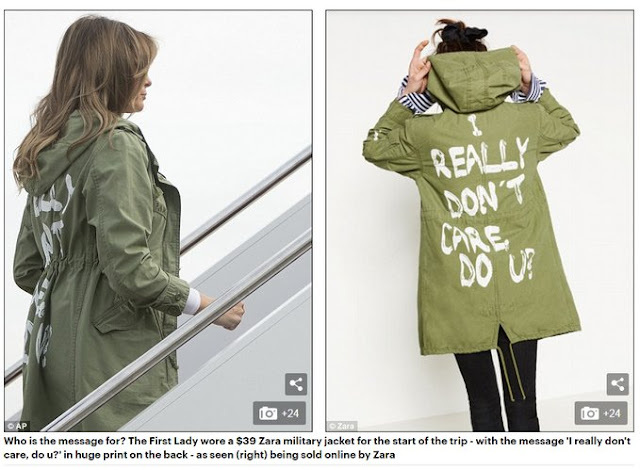 Their children are removed separately and held in different metal cages in a dirty and old warehouse in Texas where Melania Trump wearing jacket "I really don't care, do u?" to visit them today. Over a six-week period at least 2,000 children have been separated from their parents. Under heavy criticizes of American people and the urge from Democrats and many Republican Lawmakers; Trump signed yesterday his Executive Order to end his illegal family separation policy; but relief just be temporary.